Duplex, The Rooftop Venue has lots of surprises in store for you our valued partygoers. Soon you will see a completely refurbished 6th and 7th Floor, a newly styled logo and in particular our distinctive X symbol. As you arrive and exit our lifts you will immediately be surrounded by a totally new decor scheme, a totally changed environment, an array of color and that feeling of comfort and relaxation you can only experience in a truly international lounge setting. We are confident we have created a setting unequalled in Prague and a feeling of being in a truly special place. 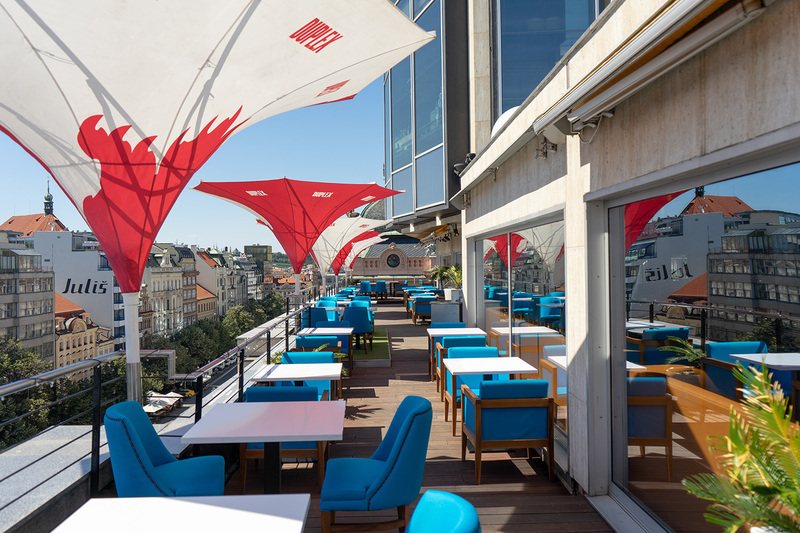 Our famous terrace too has had a complete change of theme and a level of furnishing which allows you to savor the really unique views thru the streets surrounding Wenceslas Square and the ornate rooftops which simply cannot be enjoyed from any other vantage point. Sunsets too are special from this location so come on up and enjoy a sundowner or two. Design features from the 6th Floor are evident and a new environment has been created in our Club linking both floors to create a really coordinated venue. Our food has had a complete ‘makeover’ with our new kitchen team led by Roman Vaněk, Tomáš Černý and Luboš Havelka creating easy but special dishes often best shared. The food theme is Street-food From The Silk Road and all our small plates are designed for you to share an array of tastes spanning a route from Rome to Java. Some delicious main courses also feature and when you taste our Signature veal burger with foie gras you’ll definitely be want to return. We believe we will pleasantly surprise both you and your wallet with real quality and tastes to excite. Now to the music. Prepare to be enhanced by the line up of the very top stars of the decks who will perform at a Duplex between now and the end of 2018. DJ’s you thought you might never hear or see will join us for some very special clubbing experiences. Keep your eye on our website duplex.cz if you don’t want to miss the very special guests who will feature every month. New Year celebrations are always tops at Duplex and this year we plan to really blow your mind. Book early or miss the greatest party between heaven and earth. As you know the very top clubs feature the very top sound systems and here Duplex will not come up short. Over the next couple of month a Funktion One sound system will be installed not only in the club but also on the 6th Floor and on our terrace. We really will be the defining location to enjoy the top sounds from the world leader in dance music reproduction. Be the first to know what’s happening and which really big names are appearing by registering on our website www.duplex.cz to receive our newsletters.